This is the third article from our Google Data Studio series. In our first article, we have covered a comprehensive Google Data Studio tutorial. In the second article, we published a marketing and SEO template for all kind of online marketers. 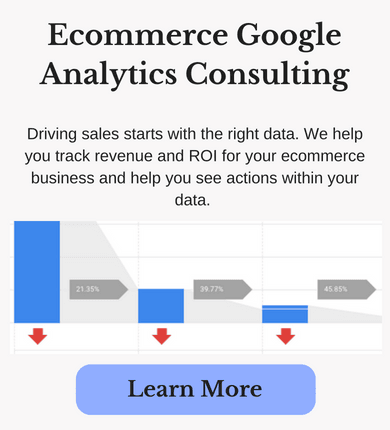 Now, we are giving away our top Google Data Studio ecommerce template. Click on the button below to view and copy our ecommerce template. Below we have mentioned a step by step guide to get you started. How to copy ecommerce template? Click on the create report button and select follow a few steps ahead. How to Read the Report and What’s Included? As the template contains multiple reports and it would be difficult to read for less technical people. Below I have explained each of the report included in this template. Being an ecommerce retailer, you would want to look at the most important metrics related to your online store. To help you look at the important KPIs, the top overview bar is very helpful. This report helps in understanding the behavior of new vs returning visitors. You can see if you have more returning visitors or new visitors and which group have the highest sessions. Which source/medium generates more revenue? If you are promoting your product on different platforms, then you will definitely want to see which source is generating more revenue. As you can see in the above image, the largest revenue is coming from Google so you will concentrate more on Google rather than any other source. What is the most popular product on my store? This report displays the top revenue generating products. Click on the dimension or any of the metrics to sort them in ascending or descending order. How do users navigate through the checkout funnel? The checkout funnel in this template is really out of the box. You can see the number of people dropping off at each checkout step. This funnel has been built using the calculated metrics and this isn’t available by default in Data Studio. Use this funnel wisely to understand why people drop off and what could be done to improve the conversion rate. Follow the below guide to add calculated metrics. Create other metrics similarly as shown the process above. For some online businesses, customer location is an important thing. The above report is helpful in knowing where your potential customers are located and conversion rate by country. You must consider optimizing your website for every device. As seen in the above report, around 6000 sessions from mobile. So visitors should be able to easily purchase product using any device. The pie chart indicates the age group that largely purchases from your store. The chart shows that half of the customers are between 24 - 34. So you should always keep products that this age group purchases and you should not be in out of stock. If you think this is the best ecommerce template, then do let us know in the comments below and don’t forget to share.